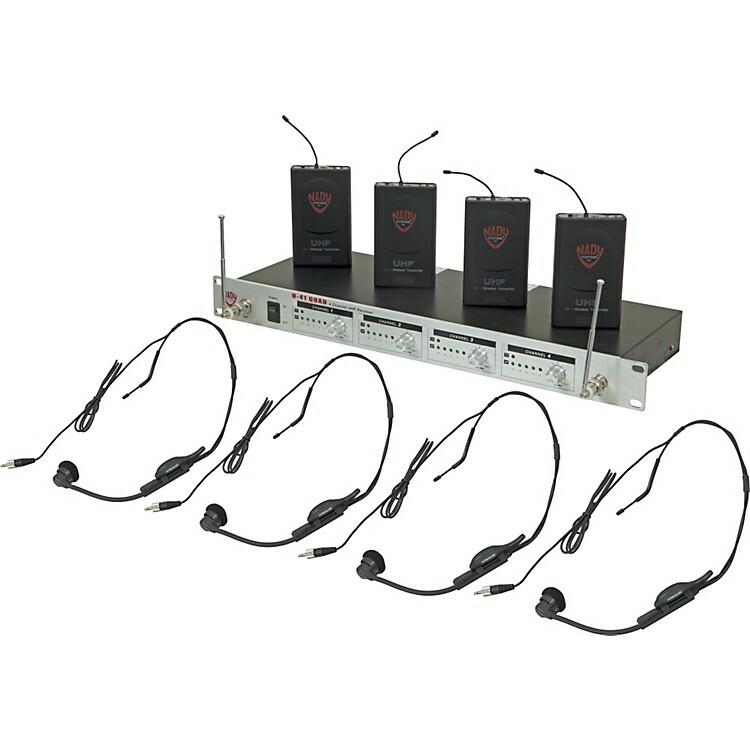 4 wireless bodypack transmitters with headset mics and a 4-channel receiver for one great price. This Nady U-41 QUAD wireless system features a professional 4-channel UHF wireless system which offers clear, natural sounding wireless and comes with 4 UB-4 bodypack transmitters with 4 HM-1 headworn microphone. The Nady U-41 QUAD receiver delivers four discrete channels in the 902-928MHz and 944-952MHz bands for interference-free performance in any application or locale. It also features Nady's proprietary companding and low noise circuit for a 120dB dynamic range. The back panel has balanced XLR mic level outputs, an unbalanced 1/4" jack line level sum output with separate volumes, and external adjustable mute control for each channel. On the front panel, the LED display indicates TX On (single LED) and 5-segment AF levels for each channel. The U-41 also features dual removable antennas. The compact UB-4 bodypack transmitter is a convenient way to add a lavalier mic (included) to your wireless arsenal, though it can also be used with your instrument if you'd like to play wire- and worry-free. The locking 3.5mm mini-jack ensures a secure connection every time out. It has an Off/Standby/On switch for allows uncomplicated audio muting while the transmitter is on. Other features include a status LED indicator that flashes once for unit on or stays steady when the battery is low, easily accessible input level adjust control for optimum sound when using the lavalier mic, and it runs on a single 9V alkaline or NiMH battery. With the HM-1 headset microphone, singers/musicians, DJ's, aerobic instructors, TV broadcasters, and others who require the highest quality vocals with improved gain before feedback can achieve better performance than is available with small omnidirectional lapel microphones or even full-sized stand-mounted cardioid microphones. With its high sensitivity and wide-band width, the HM-1 is optimally designed for both singing and speaking applications. The close-up unidirectional vocal pickup provides a full sound while suppressing irritating background noises. This headset mic features an adjustable gooseneck which can be set at any angle required by the user. The head worn support system is extremely light and comfortable, and is designed to be visually unobtrusive while worn. Its ear rests and temple provide maximum stability during use, even while moving, dancing, or shaking the head. The durable cable assembly and internal construction are designed to minimize handling noise from contact and movement. The Nady HM-1 headworn mic incorporates state-of-the-art technology for the best frequency and transient response available. The advanced design offers improved reliability under adverse operating conditions and negligible distortion as compared to other head worn mics. The result is remarkably stable performance. The HM-1 is designed to operate either with hardwired or wireless microphone transmitters. And unlike condenser mics used on many other headworn mics, the dynamic mic on the Nady HM-1 requires no draining phantom power or troublesome batteries. The headband's shaped rests are placed on top of each ear and the rest of the band extends around the back of the head. The pad supporting the gooseneck rests on the temple in front of the ear providing the necessary stability during use. 500 feet of freedom for four is just a phone call or click away. Order this wireless system today!